Longines shows its mastery over sophisticated design with this classy piece from the Conquest collection. With a precise dial showing large numerals and precise one minute and five minute increments. The indices are marked with blue and yellow colour schemes and a large date window sits at the 3 o'clock mark for added efficiency. Made with decades of Swiss watchmaking expertise. 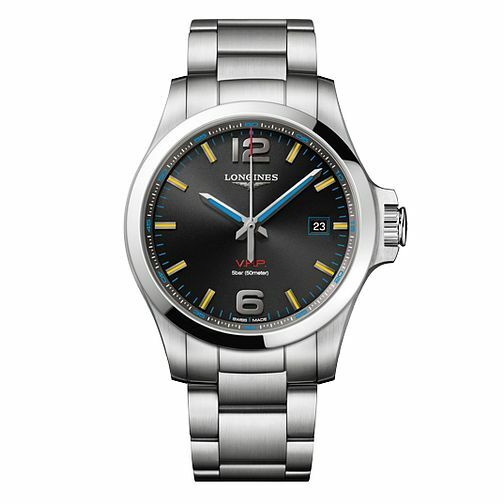 Longines Conquest V.H.P Men's Stainless Steel Bracelet Watch is rated 5.0 out of 5 by 1. Rated 5 out of 5 by Anonymous from Fantastic Value & Quality Best watch Longines has produced for years at a great price. Dial is fantastic as is the overall feel of watch. Ideal to wear everyday or special occassions. Special engraved case back and packaging added bonus.